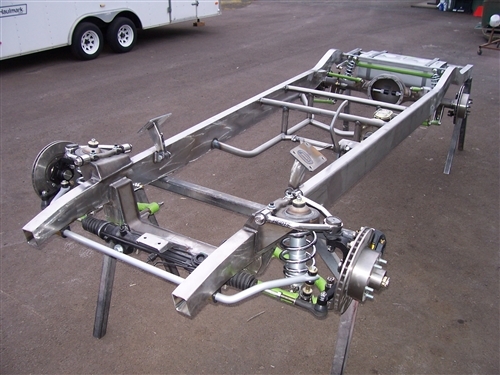 Our team has been building street rod chassis for decades and knows what works and what doesn’t. We know that not everyone drives a Chevy or Ford, and we have successfully retro-fitted Mustang II front-ends into cars that didn't have specific kits available. With a short conversation and a few measurements we can determine what is a close fit that will minimize the fabrication needed upon installation. The example shown is our '34-'36 Chevy truck frame using a '37-'39 Chevy car Mustang II IFS. Having used nearly every commercially available suspension part out there, we are very confident in recommending this system. We are also ready to help you sort through the different choices and options to make sure you get the best parts for your project. Not sure what's right for you? Check out our Suspension FAQs or give us a call!